As we evolve, so do our products and partnerships. By bringing together industry leaders from various scopes of performance we are solving building envelope challenges with superior panel systems and multiple wall assemblies. Click here to access design files including cad drawings, specifications, videos and related documents. The CADdetails program is developed specifically for design professionals with the goal of getting manufacturer-specific product information into their working plans. The FUSION™ DRILLFREE™ and EVO™ RIVETLESS™ extrusion systems provide Architects and Spec writers with a structurally superior and aesthetically preferred exterior cladding for buildings. Our fully tested innovative design is patented and fabricated exclusively through our fabricator network, providing consistent quality and warranty assurances, coast-to-coast. Outstanding in-field performance, price competitiveness and ease-of-availability will make specifying EVO™ and FUSION™ wall panels as basis-of-design, a smarter decision. Carter Architectural Panels objective is to cause change in the specification process through Architects and Specifiers, to accept tested panel systems, which perform exceptionally. Design improvements, both engineering and materials, can improve building envelopes everywhere. A standardized quality assurance fabricating process can ensure consistent design, ensuring the best performance. EVO™ RIVETLESS™ panels have concealed fasteners, are patented, fully tested and available through a national network of fabricators. EVO™ RIVETLESS™ panels are value engineered and designed to withstand the harshest elements and toughest competitors. Innovations, like our integrated stiffener help decision-makers minimize risk in selecting the best systems to solve building challenges. Find out why Carter is North America's Extrusion System Specialist. 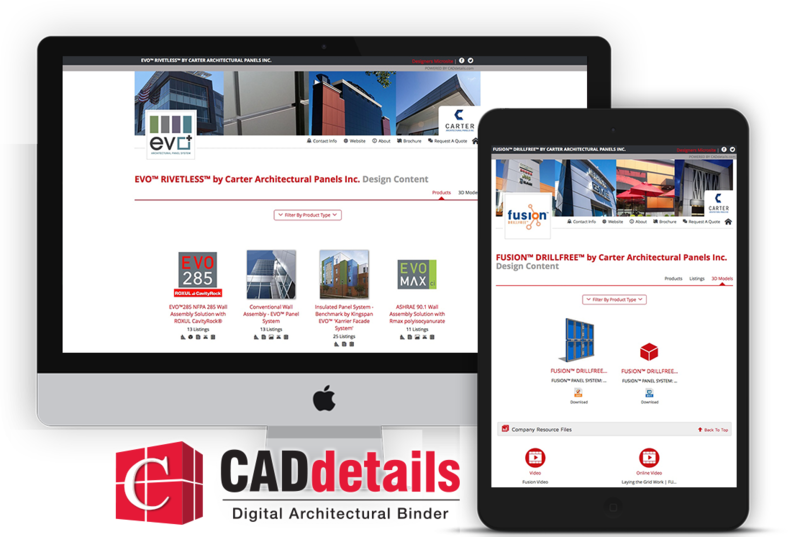 As Carter Architectural has continued to evolve as a provider of solutions for the architectural panel industry, we are fortunate to now be recognized as the creator of the EVO™ RIVETLESS™ and FUSION™ DRILLFREE™ extrusion system. From our sheet metal origins, which led to architectural panel fabrication, which led to supply & installation of projects at site, we were quick to realize the demand for our RIVETLESS™ and DRILLFREE™ extrusion system. Through offering the fabricating rights to other fabricators we have been able to duplicate ourselves, thereby meeting the growing demand across America, for our wall panel extrusion systems. © 2017 Carter Architectural Panels Inc.